We found ourselves in Dexter on an errand; having gotten off to a late start, it was already time for lunch when we finished. With so many offerings available in nearby Ann Arbor, we took advantage of our location and followed scenic Huron River Drive into the city. Where does one begin in a city bursting with great restaurants? Well, for one thing it is a Saturday, which means the city is packed with visitors, in that case our mind wanders more to, “where can we find parking?”. We were looking for something quick and tasty so we headed over to Ray’s Red Hots on E. University; to our delight we found easy parking on the street and no line at the counter. 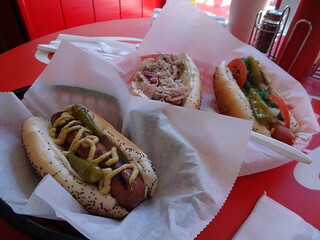 The menu seems endless (especially when you are super hungry), a Chicago Dog is a must, they do it right, all the way to the celery salt and poppy-seed bun. The Slaw Dog was a less obvious choice, but the guy behind the counter highly recommended it; a redhot dog, melted Swiss, BBQ sauce, raw onions and homemade coleslaw, I have to admit it was really good! The Diablo Dog was our final pick, a grilled all beef dog stuffed with jalapeno peppers and cheddar cheese, also served on a poppy-seed bun; we both liked it, the flavor of the dog highlighted by the grilling process, yum. Hot dogs are served in plastic baskets with tissue liners, be sure to grab lots of napkins. 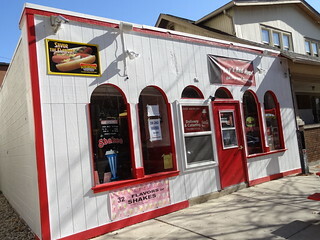 The place does a brisk business, as we sat at our high-top table the line continued to grow; patrons ranged in age from the very young to the very old, everybody loves a good hot dog! The sun shone brightly in the blue Autumn sky, we thought we’d head over to the east side of town and do a couple of activities. 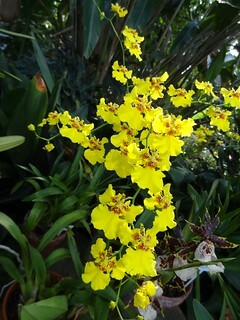 Matthaei Botanical Gardens on Dixboro Rd is always a wonderful place to visit. Find a parking space that suits you, remember your number, walk to the pay station near the building entrance and deposit your quarters, that’s it, there’s no additional admission fee. The complex of buildings was designed by Midland’s own Alden B Dow; the conservatory and auditorium were completed in 1965, the look is definitely mid-century. 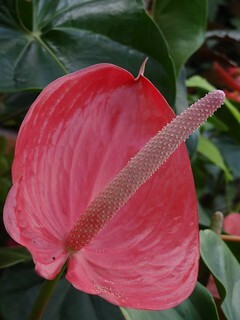 In the lobby people are milling about, the garden store shares the space and invites you to browse. 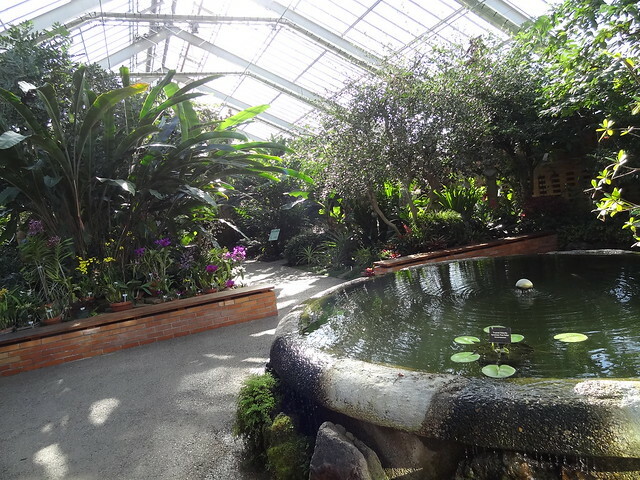 We enter the conservatory and notice the change in temperature and humidity, this is the Tropical House, leafy green plants dominate the large room. A raised pool is the first thing to greet you; fish swim about, Lilly pads grow on the surface, water gently trickles over the sides. 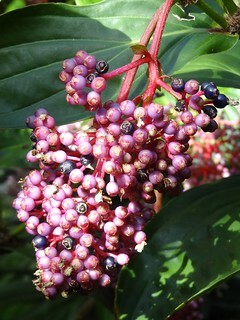 With the exception of the Orchids, few plants on the main floor are currently in bloom, when you see a splash of red, purple or hot pink it really catches your eye. Stairways line both sides of the original building, be sure and go up one side and down the other. From this height I get a panoramic view, walking further on we find ourselves in the Desert House. I remember watching re-runs of Lost In Space as a child, this could be the set for one of the episodes. 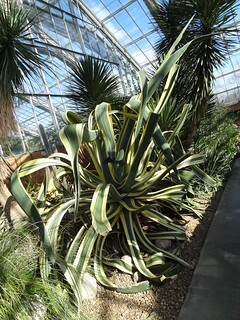 The room is all glass from wall to ceiling; giant plants rise from the ground, one in particular is variegated green and yellow, the edges of the leaves look as though they could cut you. 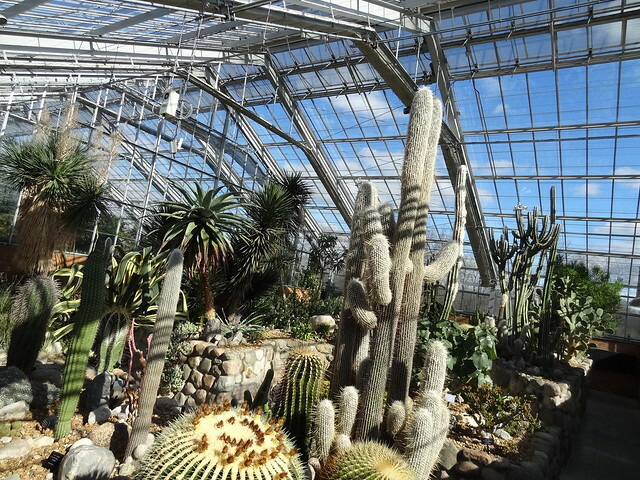 More than that, it looks like the lengthy leaves could turn into arms and grab you and pull you within, ok, maybe I watched too much Lost in Space……Cactus come in every shape and size, they look right at home on this sunny day basking in the light. We cross over, taking the other side back, passing a seating area that reminds me of summer; a patio table and chairs offers visitors a little respite. On the other side a waterfall pours over an orange brick wall into a shallow pool, the sound soft and relaxing. 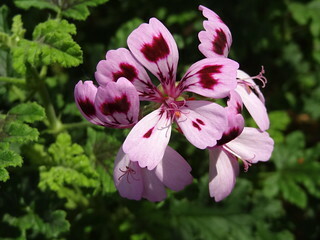 We see splotches of color in Flamingo Lily, bromeliads and Scented Geraniums. The outdoor gardens were closed off by orange fencing for the time being, giving us something new to see the next time we come. Our last stop for the day was Domino’s Petting Farm. We have been coming here for many years, all the way back to the days when Mr Monahan owned Domino’s and he had an incredible museum filled with vintage cars, bicycles, Detroit Tigers memorabilia, and an area dedicated to Frank Lloyd Wright. 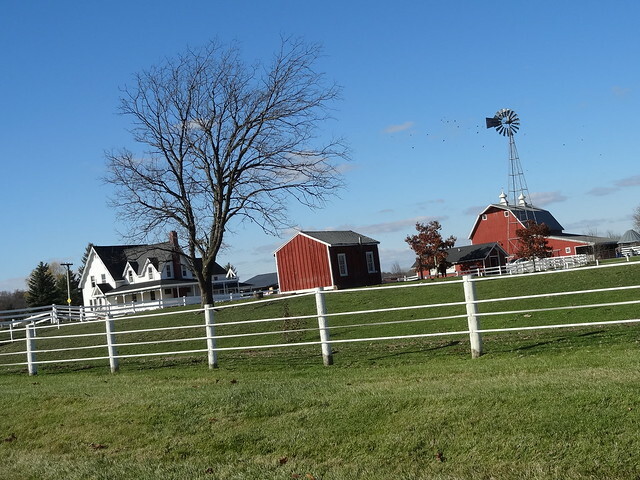 The petting farm opened in 1984 and was originally a traditional working farm owned by the Zeeb family. 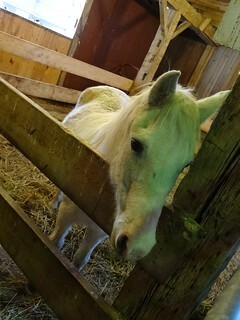 The barn itself was built in 1925 and now houses pigs, sheep,bunnies, goats, donkeys and ponies. 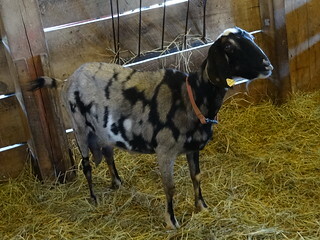 From time to time the farm rescues animals and later finds them new homes. 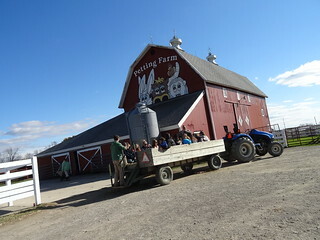 After I petted all the animals I could, we walked out the back to the rest of the farm; a birthday party was taking place and guests were loading into a hay filled wagon pulled by a tractor for a ride. We walked out past the pond to where the cattle were grazing; I have never seen so many different colored cows in one place, black, brown and white, they were speckled, spotted and striped. Highland cows look badly in need of a haircut; how do they see through all that hair? 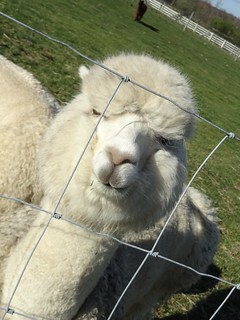 As we approached the llamas they hurried over to the fence, as curious about us as we were about them. Each animal sports its own unique haircut, they are friendly and act as if they are posing for the camera. I come across more goats, their fur a colorful pattern that resembles a sweater; some enjoy being scratched, others are just looking to see what kind of food you brought them! 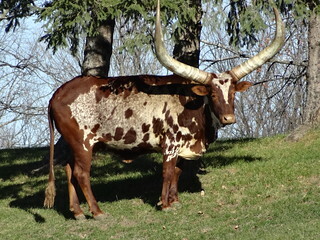 After we had made the rounds we got back in the Jeep and drove over to the section where the Watusi live, have you ever seen a Watusi in person? They are beautiful animals and those horns, wow! We just sat and watched them for a little bit, not wanting to disturb them; they looked content standing in the lush green grass.